Pakistan thrashed England by eight wickets in Cardiff on Wednesday to book their place in the Champions Trophy final. They will now play the winners of Thursday's second semi-final between India and Bangladesh at Edgbaston in Sunday's final at the Oval. Set just 212 for victory, Pakistan finished on 215 for two, with Azhar Ali (76) and Fakhar Zaman (57) sharing an opening partnership of 118. When Mohammad Hafeez pulled Ben Stokes for four, Pakistan had won with a whopping 77 balls left on their innings. But the real damage was done in the field as Pakistan held tournament hosts England, the only side who won all their three group games, to just 211 all out. Hasan Ali took three for 35 in an innings where England didn't manage a single six and none of their batsman made fifty after Pakistan captain Sarfraz Ahmed won the toss and sent them into bat on a used pitch. Earlier, England struggled on a slow pitch against a disciplined Pakistan attack to limp to a paltry total of 211 all out. Pakistan bowled and fielded tightly to restrict the sluggish hosts who failed to master a lifeless wicket and collapsed from 128 for two in bright and sunny conditions which normally favour batsmen. Pakistan captain Sarfraz Ahmed won the toss and England openers Alex Hales and Jonny Bairstow, replacing the out-of-form Jason Roy, made a solid start. Hitting boundaries proved difficult, however, and a frustrated Hales, on 13, spooned Rumman Raees to cover with a loose drive. Bairstow, dropped twice, accumulated 43 runs through good shot placement and quick running between the wickets before he pulled seamer Hasan Ali to Mohammad Hafeez at deep square leg. 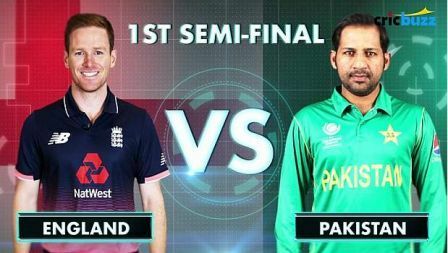 Joe Root and Eoin Morgan continued to score at about five runs an over against accurate Pakistan bowling and tight fielding. But Root, on 46, nicked leg-spinner Shadab Khan to wicketkeeper Sarfraz and Morgan (33) aimed an expansive drive at the lively Hasan and gave Sarfraz another catch to leave England in trouble at 141 for four. Jos Buttler (4) lasted seven balls before edging Junaid Khan to Sarfraz and Moeen Ali (11) was brilliantly caught by a diving Fakhar Zaman running round the mid-wicket boundary. Adil Rashid was run out for seven trying to pinch a quick single and Ben Stokes, one of the most destructive batsmen in the world, took 30 deliveries to reach 10 and failed to hit a boundary in a scratchy 34 before skying Hasan to Hafeez. Liam Plunkett made nine and England's misery was completed when Sarfraz ran out Mark Wood for three with one ball of the innings remaining. Defending champions India play Bangladesh in the second semifinal in Birmingham on Thursday. J. Bairstow c Mohammad Hafeez b Hasan Ali 43; A. Hales c Babar Azam b Rumman Raees 13; J. Root c Sarfraz Ahmed b Shadab Khan 46; E. Morgan c Sarfraz Ahmed b Hasan Ali 33; B. Stokes c Mohammad Hafeez b Hasan Ali 34; J. Buttler c Sarfraz Ahmed b Junaid Khan 4; M. Ali c Fakhar Zaman b Junaid Khan 11; A. Rashid run out sub (Ahmed Shehzad) 7; L. Plunkett c Azhar Ali b Rumman Raees 9; M. Wood run out (Sarfraz Ahmed) 3; J. Ball not out 2; Extras (lb1, w3, nb2) 6; Total (all out, 49.5 overs) 211.